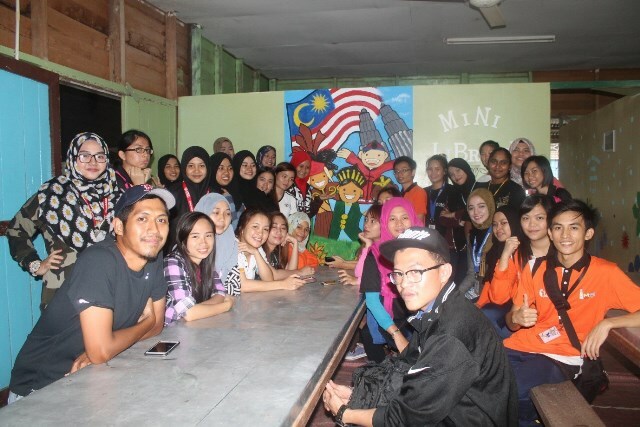 TUESDAY, 7 JUNE – A community service programme was held recently at Kampung Baru Jumpa, Tenom organised by 35 students under the credited co-curriculum Students and Community Interaction (INTERIM), Semester II, 2015/2016 Session. The programme themed, “Changing Lives, Transforming Community”, involved 150 students of primary, secondary schools and the residents of the village. Among the main activities was an English language clinic aimed at helping school students to communicate and master the English language better. An activity related to the spirit of patriotism and unity were also held, including a mural painting activity, singing of patriotic songs and national day logo design competition aimed to inculcate a sense of affection and love for our country Malaysia among the village community. Programme Director, Dayang Noraini said, besides fostering closer ties, the programme aimed to enhance the personality and hone basic soft skills of UMS students, which was crucial in the development of human capital for the nation. Meanwhile, programme coach, Amer Azlan Abdul Jamal believed that this programme offered an opportunity for students to give back to the community, according to their areas of expertise learned at the university. “For example, the English language activity which was planned and conducted by the students who major in TESL from the Faculty of Psychology and Education. The mural painting was conducted by students from the Creative Arts. Our students come from various fields, and an asset and would be a waste if not tapped into for the benefit of the local community,” he said. The highlight of the programme was the construction of a mini library including reading materials, which was funded by a communication company, Celcom Timur Sabah, Sabah State Library and several other local companies. The library was officiated by the Chief Financial Officer (CFO) representing Celcom Timur Sabah, Shaharul Niza Mohamad and the Village Chief of Kampung Baru Jumpa, Yamuk Acho. Yamuk in representing the village expressed his gratitude and thanks to the UMS students for having chosen the village to conduct their community service programme.